This is so cute! I want this paper now! This collection couldn't be more perfect here! I love this line! I'm pretty sure I bought the whole thing. Now I'm waiting for the perfect photos to use with it. I love your layout and the wonderful retro feel! I love this!!! The colors are great and I love how you put the date on it. Awesome page Mary Ann!! Love the b&w photos with the colors from the EP collection! The circle elements are great and I love the way you used the arrows on your photos! Such a wonderful layout!! I love those retro pictures!! Great layout! I love the colors against the Kraft color background. I love the cluster of embelishments,,,love it. Hi! I'm your newest follower! Came your way from the blog hop! I look forward to connecting with you! Love this layout! 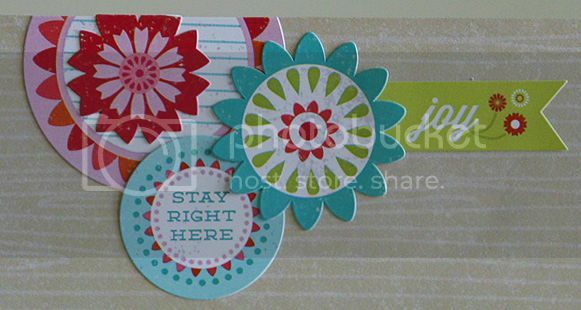 I found you through Today's Creative Blog-I don't usually find many links for scrapbooking in link parties, so I was pleased to see this posted! Great page with wonderful colors! I was happy to see a scrapbook layout!